It’s Friday night and you’re a lonely arts faculty member looking for somebody to collaborate with. You’ve worked with other artists before. Sure they’ve been great—but you want something new: something daring, something slightly scientific. That was the idea behind artist and Concordia Professor Peter Flemming’s “Blood, Brains and Other Trains” colloquium held at Concordia from Oct. 19 to 22. The colloquium, which is a term for seminars held by different lecturers covering a variety of topics, helps Arts and Science Faculty members meet and mingle while Flemming played matchmaker. Normally, artists and scientists have to work together on grants without meeting beforehand, said Flemming, which can be problematic. “We just put these [artists and scientists] together, and it may look good on paper but then in reality there are difficulties because there isn’t a lot of chemistry,” he said. 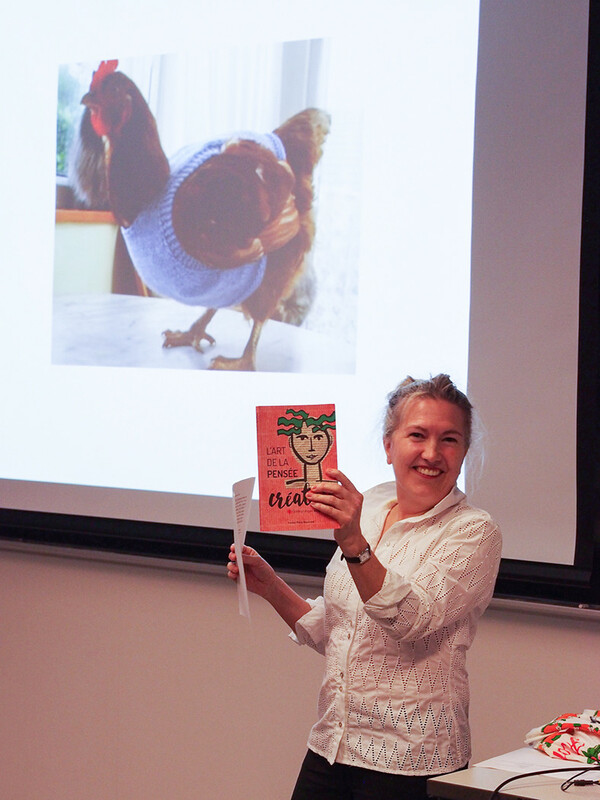 On Wednesday night, Dean of Fine Arts Rebecca Duclos began the colloquium, opening the doors to her faculty with the Hybrid Bodies Project book launch. A project ten years in the making, the Hybrid Bodies Project explored the non-medical effects of heart transplants on recipients through art exhibitions the public could see and feel. Duclos further praised the colloquium and the Hybrid Bodies Project as “bringing together not just the ideas but the people who come together around the ideas.” More than 30 people, including part-time faculty, had squeezed together that night into the rectangle foyer abutting the Faculty of Fine Arts Gallery. The colloquium continued the following evening, connecting artists to scientists with its first of two “rapid-fire salon sessions,” where lecturers from across faculties presented one topic they were intimately familiar with. That transdisciplinary experience could not only benefit students, but also further improve mental health research, said Andrew Ryder, director and founding member of Concordia’s Centre for Clinical Research in Health. For example, anthropologists, who study humans, past and present, could work with him, he said. Together they could develop a cultural, historical and scientific approach to tackling depression, he continued. Louise-Marie Bouchard, a French studies professor at Concordia, used a green and orange scarf she wore that night to show the problem-solving power of creativity. Without it, her outfit would have been all black and white, she said, but at the last minute she found and added the colorful accoutrement. Bouchard also shared the results of Dr. Olivier Diec, who started a garden in the parking lot of his dialysis ward in Longueuil, inspiring his patients to improve their diet, reduce salt intake and grow their own greens. Her new book L’art de la pensée créative, written over four years and recently self-published, details how creative processes can create solutions in every field. Thursday night’s blend of arts and science presentations concluded with a keynote delivered in the Hall building auditorium by sculptor and installation artist Kim Morgan. An associate professor at the Nova Scotia College of Art and Design University in Halifax, Morgan had collaborated with other disciplines since 2004, and her body of work embodied what the colloquium hoped to achieve: unity between the arts and sciences. Kim Morgan’s dress features scans of her own blood cells. Photo courtesy Kim Morgan. In 2006, before the advent of GPS, Morgan had worked on Time Transit, a project that combined artistic visuals with tracking systems to create public art installations on a city bus and bus stops along route number four in Regina, Saskatchewan. Fixed LCD screens gave commuters on the bus and at the bus stops previews of their upcoming destinations, almost like a Google Street View with a live video feed. Her current projects combine the arts with medicine, and her recent body of work came from her body—literally. 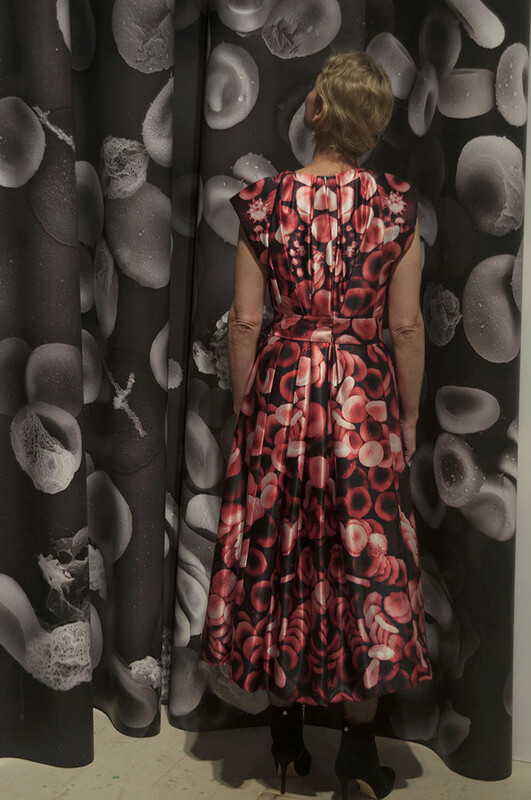 As part of Morgan’s “Blood Work” series, she worked with NSCAD Professor Gary Markle to scan her own blood cells, enlarging the images and using them to design a dress. In 2004, Morgan constructed chandeliers using fat lipids to form a dazzling array of dangling, multi-colored test tubes showing that, perhaps, beauty does lie within. And even though Morgan, through her Blood Work series, and Bachmann, through her Hybrid Bodies Project, have both experienced myriad successes marrying the arts with sciences, controversy looms. Artists can’t brazenly enter hospitals and just scan anyone’s blood, warned Morgan. She mentioned cases where physicians challenged artistic endeavors on humans, believing them to be unnecessary and intrusive procedures, purely for the sake of art. Plus, when professionals from disparate fields come to work together, happiness isn’t guaranteed, and an unhappy marriage is a possibility.